Blue Waters is comprised of a robust and capable Local Area Network coupled with a redundant Wide Area Network to provide leadership class data transfer capabilities and resiliency. Through active monitoring and data collection this network is kept in optimal performance. To see the network usage charts showing Ethernet network performance between Blue Waters subsystems, out of the Blue Water system, and out to the Wide Area Network, select the link below. The NCSA Network Engineering team, working with Cray, provides Blue Waters with external network connectivity which is comprised of an InfiniBand network for interconnecting to the storage infrastructure and with Ethernet infrastructure for connectivity off of the Blue Waters System. The Ethernet network provides 128 ports at 40Gbps with the design that the network will be sufficient to support any traffic the Blue Waters system can generate. 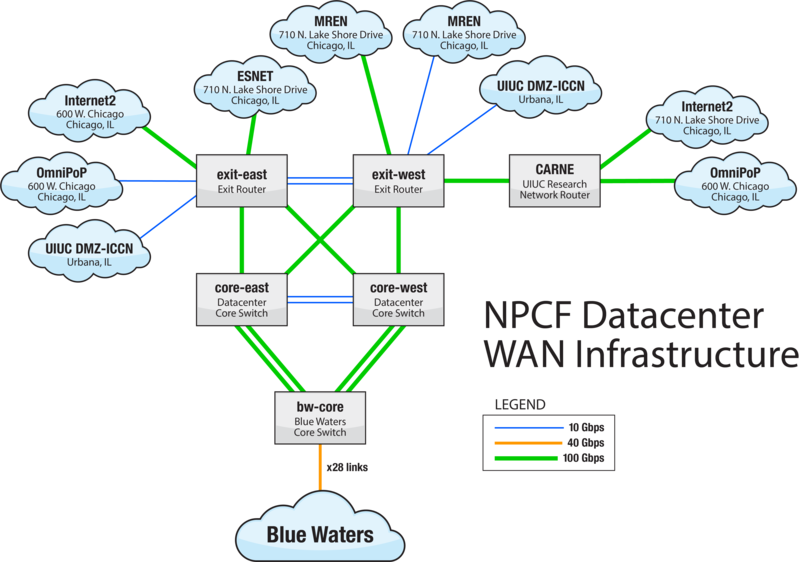 This Blue Waters Ethernet network then connects at an aggregate of 400Gbps to the NCSA backbone in a resilient mesh of redundant 100Gbps links between the core and exit routers. This provides a substantial infrastructure supporting scientific discovery. For Wide Area Network (WAN) transfers, NCSA provides strategic connectivity from Blue Waters to the key regional and national networking infrastructures which significantly complement each other. There exist four 100Gbps and multiple 10Gbps peering connections from NCSA for a robust and rich degree of connectivity to the research and education (R&E) ecosystem. Through the InterCampus Communication Network (ICCN), the redundant dual path regional optical network (RON) connecting the campuses of the University of Illinois System, a robust infrastructure is in place with ample capacity to grow as needed. Over this RON, a 100Gbps connection exists to Internet2 which provides broad reaching access to and from the R&E institutions across the United States. This connection provides advanced layer 2 services for nimble and strategic collaborations with other R&E institutions. This connection also provides advanced layer 3 services delivering IP and commercial peering services to NCSA. A second 100Gbps connection peers with ESnet to provide a high capacity connection to Department of Energy supported institutions and sites for big data research resulting in scientific discovery. A third 100Gbps connection peers with the Metropolitan Research & Education Network (MREN) providing capacity connectivity at an International peering facility in Chicago. The fourth 100Gbps wide area connection is with University of Illinois System at Urbana Champaign which itself has broad connectivity including a 100Gbps peering with OmniPoP, the Big Ten Academic Alliance regional network. This provides great connectivity to Illinois researchers and redundant paths to the R&E ecosystem. The top 10 data moving autonomous systems in the last twenty-four hours.